Turn payment in to church office marked with student’s name and UMARMY. Students entering 3rd grade and up are invited to join us for a week at one of our favorite places. You do not want to miss out on the fun! Turn payment in to church office marked with student’s name and Lakeview. We GATHER and GROW in faith, so that we may GIVE our time and talents, and GO spread the love of God. On Sunday evenings, during the school year, our Senior High students will meet in Waller Hall for a meal and open gym, followed by bible study and discussion. Each Wednesday, during the school year, Junior UMY students will meet in Waller Hall for a meal, fellowship, games and grade level Bible study. Starting Sundays in September, Sunday School for our students will look a little different. 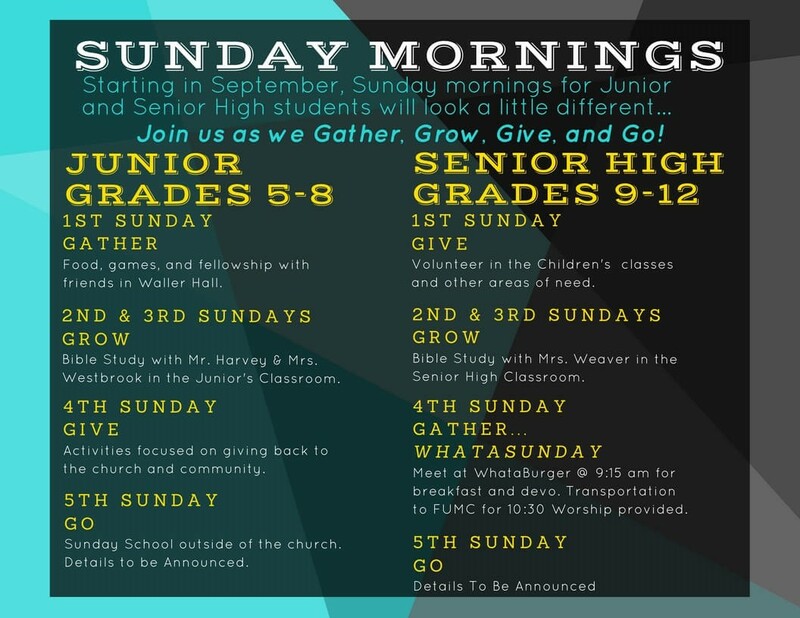 We invite you to check out the schedule and make plans to join us as we Gather, Grow, Give, and Go! Follow the UMY on Instagram!